Been yearning to taste this delight ever since bookmarked last summer.With right ingredients in hand and the ambiance warm enough,finally got the chance to contain the desire. Eralda's original recipe of the ice cream follows David lebovitz's approach ,while my recreation here is influenced by the by Rachel Albert-Matesz's dairy free recipes from her latest book, The Ice Dream Cookbook ,replacing heavy cream with coconut milk.Smitten by the superb benefits of coconut,all of my home made ice creams now incorporate coconut milk for dairy cream. Besides the coconut milk,the other supreme element in the ice cream are Kumquats.I always keep an eye out for unusually healthy foods,glad I noticed kumquats in a market here.Kumquats are like the concentrated mini oranges or clementines with edible peel.But if these tangy little morsels are not in your reach,you could still make the ice cream,simply substitute them with some fresh orange zest and orange juice instead. 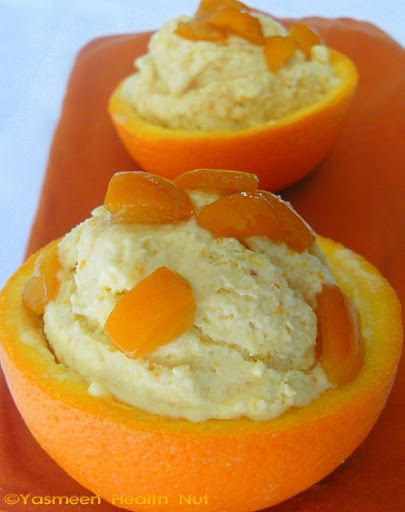 Recipe : Dairy free Kumquat Ice cream ,inspired by Eralda's recipe at 5 star foodie and Rachel Albert-Matesz as in Ice Dream Cookbook. 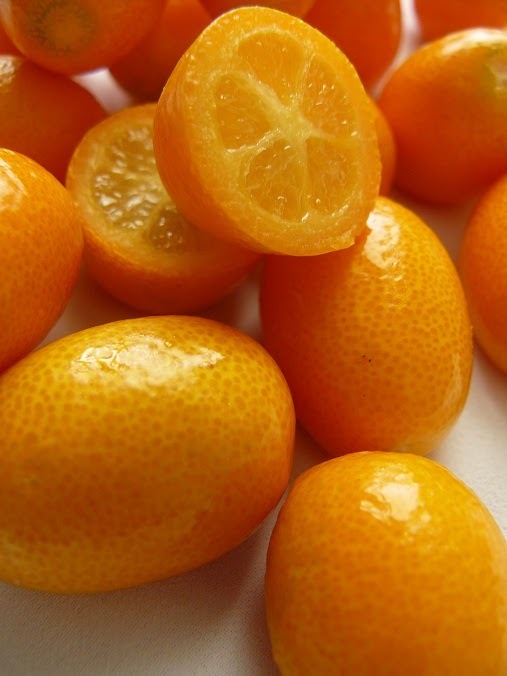 2.Process the kumquat in a food processor or vitamix until finely chopped,the add the coconut milk,sweetener(honey or agave),salt,the gelatin or agar-agar mixture and blend again until well combined and smooth. 4-Scrape the chilled custard into the canister of your ice cream maker. Churn according to the manufacturer’s instructions. 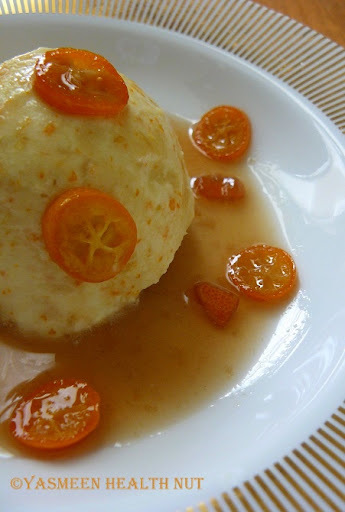 In a small pan,heat the oil and add the kumquats(or zest),let soften and caramelized,about 3-4 minutes.Now add the honey or agave and warm,let heat up on low heat,when bubbles start to emerge,3-4 minutes.Turn off the heat.Cool for few minutes and serve over the ice cream. Health Nut Challenge 6 - I Scream For Ice Cream! Nothing can beat the summer's scorching heat like the frosty treat.Gearing up for the heat,I invite my creative foodies to scream for the summer's best refreshment,take the next Health Nut challenge of creating one fresh ,healthy and home made frozen treat. Homemade Ice creams are far superior than store bought,for one can customize it for sweetness , flavors ,calories without any need for preservatives or artificial colors.Also the home made quality ice cream costs less.Even if you don't treasure an ice cream machine,just following the method in my recipes to closely match the texture of machine made. 1.Delight your family with a home made frozen treat on a sizzling hot day - Ice cream,Frozen yogurt,Sorbet,Juice pop,Ice cream sandwich or cone,gelato,kulfi or any other chilled dessert or snack.Refer to Health nut recipes to get the idea. 2.Make it a healthier ice cream,use a healthier substitute for heavy cream like the coconut milk,also using nut butters like cashew cream or peanut butter or almond butter are simply wonderful for making creamy healthy ice creams.Or use light cream along with whole milk ,almond milk or soy milk. 3.Keep the sweetness in moderation.Again using substitutes like honey ,agave nectar or maple syrup are much better than plain white sugar. 4.Flavor up them with fresh fruits ,berries,nuts ,cocoa or dark chocolate.For sorbets one can also use fresh herbs like basil. 5.Limit to one entry per participant.Send me your creative frozen treat using the convenient form below, by June 31st.And please do not forget to link your post to this announcement page. Ice Dream Cook Book Give Away! 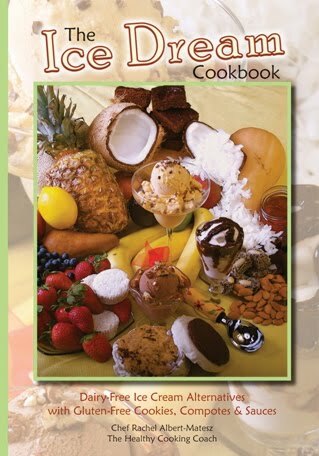 Rachel Albert-Matesz,author of Ice Dream Cookbook, has been kind enough to give a copy of her Ice Dream Cookbook,as reward for one unique recipe submitted to the Health Nut Ice Cream Challenge ,that closely abides by the rules of the challenge. I totally love the book for introducing the healthier alternatives in home made ice creams,clear and descriptive recipes with fabulous variety of flavors.I've been using her recipes to make most of my Ice creams ever since I did the review.The cookbook is a best buy for any diet-conscious ,Ice-cream aficionados and those on restricted diets(low-sugar,gluten-free,dairy-free).You can read my complete review here. ORDER YOUR COPY of The Ice Dream Cookbook: Dairy-Free Ice Cream Alternatives with Gluten-Free Cookies, Compotes & Sauces by Rachel Albert-Matesz at Rachel's blog or at Amazon.com . Oh woooooooow looks so beautiful and i love the flavors in it.. I love kumquat and this looks absolutely gorgeous and damn tasty yasmeen. Oh yummy! That ice cream must taste heavenly! This is definitely a fantastic ice cream! Wow, I love that you added kumquats in this rather than the usual oranges. i love their tangy and sharp flavor. This looks delicious. Very colorful and delicious looking iceream.Nice event for the summers and healthy icecreams sounds fun and interesting. looks so delicious..will try to send something for the event...have never attempted ice cream at home.. OMG!! This sounds extremely good. I love the flavors and of course the coconut milk. Nice, so fresh and cooling! simply superb creation. love the way you presented this...yummy. Thats a fabulous icecream, love it.. This sounds so so delicious! And I know what to send in for your event...am making something this weekend, will send it in soon. Wow Yasmeen, icecream looks awesome...too tempting :)...love your healthy icecream dear...good one! 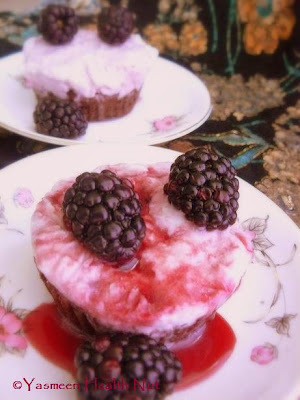 Gorgeous treat.I have already started replacing heavy cream with coconut milk in many of my dishes. A fabulous challenge.Can't wait to see the entries. Love the challenge Yasmeen.Expect an entry this week.I have a perfect treat for you. WOW Yasmeen,the ice cream looks fantastic.Wish I could participate.Hope to see some unique and healthy ice creams. Stunning presentation.I like the fact that this is made with healthier alternatives. Ooo, dairy free AND egg free ... 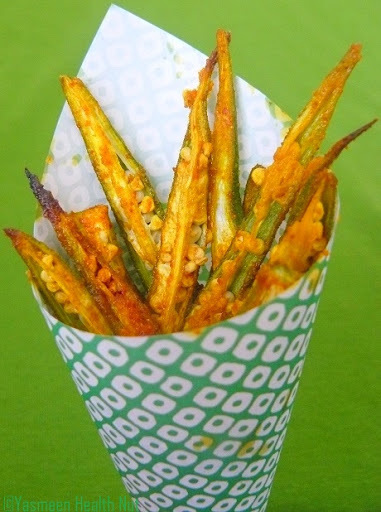 I love this recipe Yasmeen! I hope I can find kumquats in my store, because I'd love to try this out! 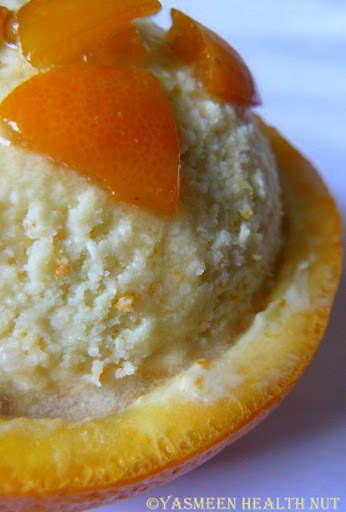 Ideal for the hot summers.I like the zesty citrus in the ice cream. The first picture is simply phenomenal.Fun ice cream for the season and also healthy. 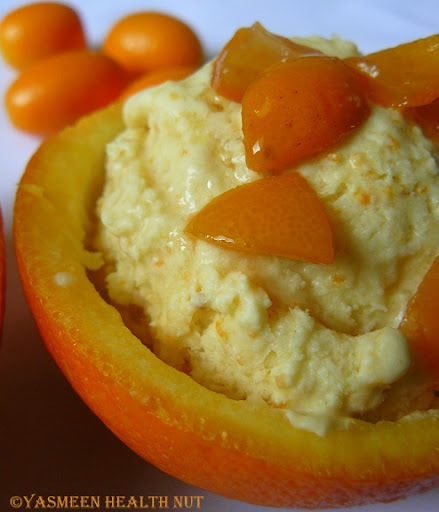 Hi have sent you my Mango Kulfi recipe. hope you get and like it. thanks for hosting. please can you check it out my recipe Rose and coconut kulfi..I'm not sure would it be ok for your event? if it is please let me know and I can send it to you..
Just sent my entry to your event..Happy hosting !! Yas, have sent you an entry..hope you got it..
Chanced upon ur space while blog hopping...! 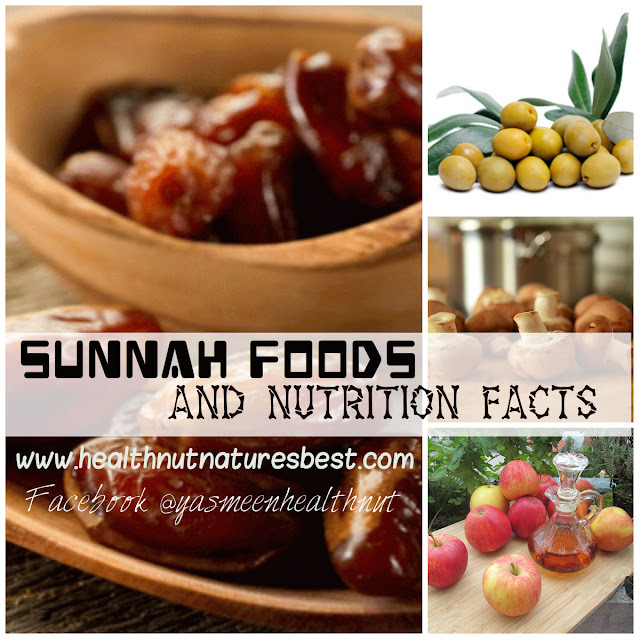 Lovely recipes ...! New Diet Taps into Pioneering Idea to Help Dieters Get Rid Of 23 Pounds in Only 21 Days!